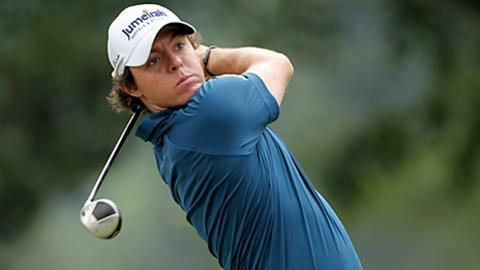 Rory McIlroy fired a stunning six-under 65 to lead the US Open by three shots after the first round at Congressional. McIlroy, 22, bounced back from his Augusta aberration to head Masters winner Charl Schwartzel and 2009 USPGA champion YE Yang. Sergio Garcia and Open champion Louis Oosthuizen were two under, while Graeme McDowell began his defence with a 70. The world's top three players Luke Donald, Lee Westwood and Martin Kaymer carded 74, 75, 74. Also at two under were American Ryan Palmer, Korea's Kyung-tae Kim, Australian Scott Hend and Brazil's Alexandre Rocha. Phil Mickelson, a five-time US Open runner-up, was regularly in trouble and had to use all his powers of recovery on his 41st birthday to card 74. But it was McIlroy's Maryland masterclass that dominated a sultry day near the US capital. The Northern Irishman is still trying to shake off the tag as the man who blew the Masters after squandering a four-shot lead going into the final day with a closing 80. He also led the 2010 Open after a first-round 63 before amassing an 80. Showing the sort of control that suggests his game is in the shape required to emulate countryman McDowell and land a maiden major title, McIlroy picked up shots on the 12th, 17th and 18th to reach the turn in a three-under-par 32. Further birdies at the first and fourth took him into a two-shot lead at five under and he missed another very makeable birdie chance on the fourth, his 14th. Another laser-guided iron from about 250 yards to 15ft set up an eagle chance on the sixth, and though he missed he settled for a tap-in birdie. McIlroy missed his birdie putt from 30ft on the short seventh but parred his way home to lay down the gauntlet with the only bogey-free round of the day. "I took the experience from Augusta, and I learned a lot from it," said McIlroy. "I just need to keep it going. I played really good out there, didn't make any mistakes, which in a US Open is huge." South African Schwartzel, who birdied the last four holes to win the Masters, went on another surge and picked up four shots in his last seven holes at Congressional. Yang, who became the first Asian man to win a major when he beat Tiger Woods in the 2009 USPGA, birdied all four par threes in his 68. "I've been playing more conservatively, less bonehead plays," said the 39-year-old Yang. Spain's Garcia, who is still fighting his way back from a prolonged slump, bogeyed the last to join South African Oosthuizen. "It was a nice start but there's still a long way to go. We haven't done anything yet," said Garcia. But he leaked four bogeys in five holes and then double-bogeyed the 18th to turn in 39 before coming home in one under. "We all struggled a bit and we couldn't get much momentum going," said Donald, who has won twice this season and finished in the top 10 in 15 of his last 16 tournaments. "Three-over is not great but I know if I shoot something in the red I'll make good headway." Westwood, who like Donald is seeking his first major title, made six bogeys and two birdies in his 75. "I didn't swing it very well and you just don't get away with it at a US Open," said the Englishman. "If we had played like the top three in the world it would have been more enjoyable for the people to watch, but none of us played well and we all just about got what we deserved." McDowell began with a bogey at the first but redeemed himself immediately at the short second and picked up another shot on the sixth before parring his way home. "It's a dream start and I'm very happy with it," said the Northern Irishman, who has admitted to feeling the burden of being the defending US Open champion over the past few months. "I felt great. It felt like a regular major championship. It didn't feel like I was defending anything. "I set myself some challenges this morning to go out and try to think well, try to go through my processes correctly, through my routines, and just be patient and enjoy the round. And I really accomplished those things." England's Robert Rock did not have time for a practice round after he was delayed in the UK trying to get a US visa but went round in 70 for one under. Three-time major champion Padraig Harrington of Ireland carded a level-par 71, while American world number six Matt Kuchar and Ireland's Shane Lowry took 72. Ernie Els, who triumphed the last time the US Open was played at Congressional in 1997, carded 73 alongside England's Paul Casey and Scotland's Martin Laird and Stephen Gallacher. Dustin Johnson, who blew a three-shot lead in the final round of last year's US Open, ended with a 75 playing alongside Mickelson and McIlroy. Frenchman Gregory Havret, who finished runner-up last year, amassed a six-over 77 in his first start since the death of his father.